Posted on May 27, 2018 by David Tate, Esq. 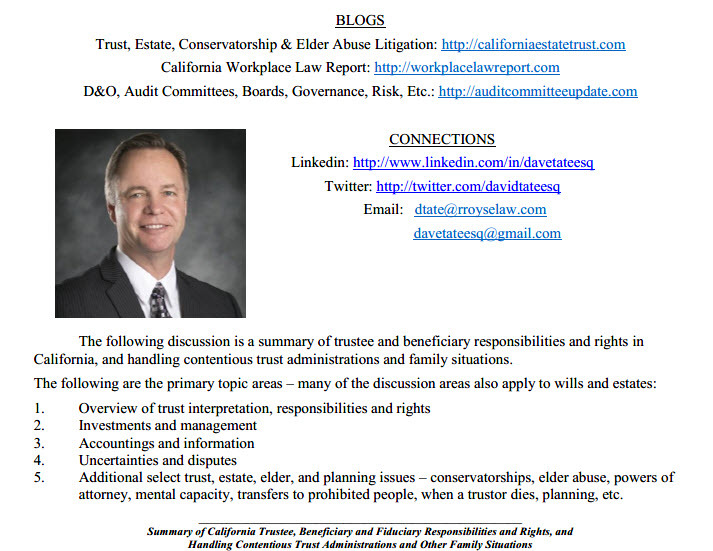 Below is a link to my paper discussing California trustee and beneficiary responsibilities and right presentation – click the link for the paper and please also pass it along to other people who would be interested. Note: the paper does not provide legal advice, is not a solicitation for services, and every situation is different – you should consult with an attorney for your particular situation. Wishing you the best, David Tate, Esq. This entry was posted in will, estate, trust, elder, contest, fiduciary, decedent, intent, disability, conservatorship, elder abuse, elder protection, trustee, beneficiary, executor. Bookmark the permalink.